Chico is a Latino teen, with black hair and brown eyes. He wears a ring on his eyebrow arch and an earring. 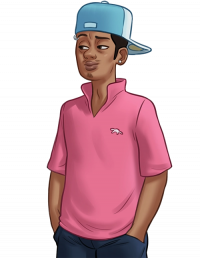 His typical attire consists of a pink popped collar polo shirt, jeans and a baby blue baseball cap put on backwards. Chico is mostly seen with Eve, Chad and Tyrone at night at the park. This page was last edited on 3 April 2019, at 02:36.